On a gloomy December morning, I enjoy the rare treat of sitting alone at my kitchen table with a cup of coffee, a toasted English muffin slathered in blueberry preserves, and a book. I wouldn’t choose this type of morning every day–I love the chaos and energy, the blue eyes and burnished blonde hair usually flying around the circle from living room, dining room, kitchen, at 8:00 a.m. on any given morning–but as a once in a while thing, this morning alone is heavenly. What book am I reading? Funny you should ask. It’s kind of a cookbook, kind of a memoir. It’s Shauna Niequist’s Bread and Wine, a book I wouldn’t have picked up on my own whim in a million years. 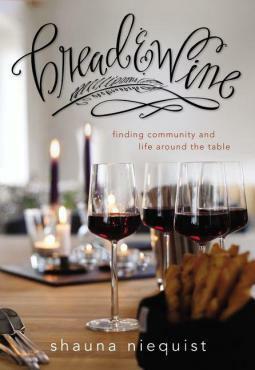 But I heard Shauna speak twice in the last year, and then a speaker at MOPS said Bread and Wine was pivotal in helping her become the cook she always wanted to be, so I ordered it from my library and here it sits in front of me. I’m not a cookbook reader. I struggle with even wanting to cook, and much more with the actual cooking. When the whole Julie and Julia book and movie were crazy popular, I just shook my head and said, “Why? Why would I put myself through a year of making complicated, French recipes?” I wouldn’t. Yeah, I’ve spent an embarrassing amount of money on learning golf and I’m still not even close to good at it. I guess it’ll be more worthwhile to try and do something well that I have to do every day anyway. I guess I’ll take a deep breathe and let myself dive over the edge. 2015, I doubt I’ll be a Foodie when I’m through with you, but I plan to make a mean Steak au Poivre with Cognac Pan Sauce before you’re over. Read more Saturday Cooking posts here!